Our schools offer higher quality education than the other options available in these communities at cheaper prices than the private schools. They cultivate lifelong learning in children and their families to ignite holistic transformation. 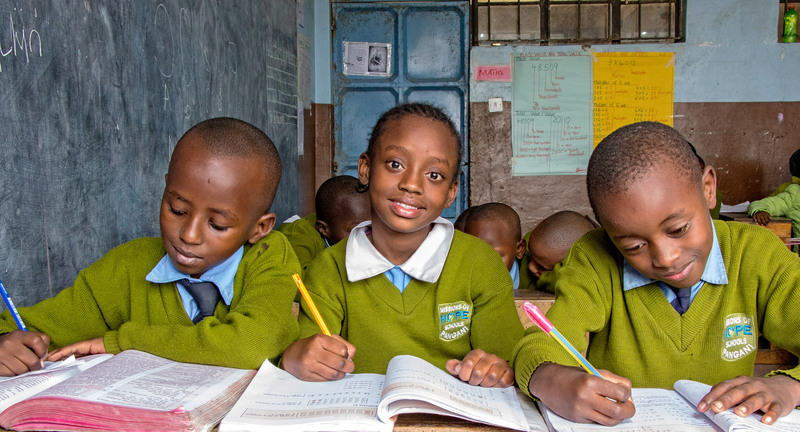 We provide a quality, Christian education to more than 16,000 children, from nursery through high school, in 23 disadvantaged communities throughout Kenya. Our students are supported through our child sponsorship program, which is facilitated by our U.S.-based partner, CMF International. For $1.25 a day, you can make a direct and profound difference in a child’s life. Your sponsorship ensures that your sponsored child receives an excellent Christian education, nutritious food, medical care and the opportunity to hear the life-changing message of Jesus Christ. Trained teachers, realistic class sizes, and safe learning environments in our 23 schools equip our students to succeed personally and academically. Our students consistently excel on their national exams. Many qualify for placement in colleges or universities upon graduation. We holistically minister to our students by giving them two nutritious meals daily, medical care, facilitating extra-curricular activities (like sports and music), teaching them God’s Word, and modeling Christ’s love. Every student is assigned to a MOHI social worker who spends their time out in the community checking in on their families. They help connect the family to our health, skills training, and business loan services that will meet their needs. Missions of Hope International continues to care for our high school graduates. A gap year program teaches these graduates valuable life skills, spiritual disciplines, and computer skills as they prepare for their next opportunities. The MOHI Higher Education Fund helps qualified students achieve their dream of earning an advanced degree. Other students may be more interested in our technical training programs located at our Kariobangi Center. Transformation begins with a child, extends to the family and spreads through whole communities.